I made a batch of veggie chili a few weeks ago when I made this bread. I am pleased to report that not only do they compliment each other as a meal but they both freeze well! In a large soup pot heat oil over med heat. Add onion and garlic, cook until tender, stirring occasionally. Add squash, carrots, peppers, corn, chili powder and s&p, cook for about 1 minute then add about 1/2 cup of water, cover and simmer until veggies are crisp-tender, about 7 minutes. 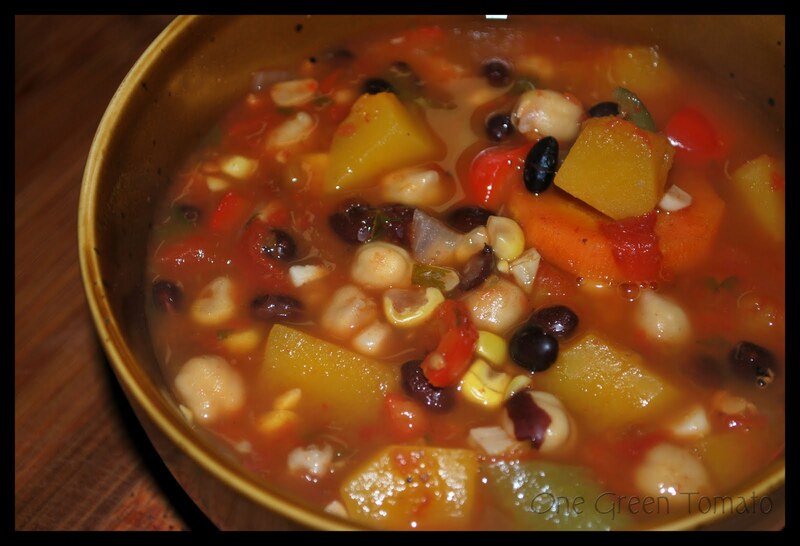 Add canned tomatoes, chickpeas, black beans and cilantro, bring to a boil. Reduce to a simmer, partially cover and cook for 20 minutes. You can garnish with a lime since it pairs well with the cilantro.